Lapp Group opened its new state of the art service and logistics centre in Ludwigsburg, the centre is the most modern facility of its kind, and its patented transport technology and automated high-rise warehouse set new standards within this sector. The centre will be good for customers, employees and the environment, and marks an important milestone on the road to continued growth for our company. The new service and logistics centre comprises three interconnected halls with a total floor space of 30,000 square metres – bigger than four football fields – plus an office building 1,500 square metres in size. The façade is 270 metres long and 11 metres high, with 30 ramps for loading and unloading HGVs. The centre was built in accordance with the latest energy efficiency guidelines. The overhead heating uses energy-efficient radiant tube heaters that ensure an average temperature of 17–18 degrees. On the roof is a photovoltaic system with 4348 crystalline modules and an annual energy yield of 1,000 MWh. This means that 72 per cent of the overall power consumption is generated on site in Ludwigsburg, from renewable sources. The new centralized location storage capacity has risen from around 70,000 cable drums to over 90,000, with ÖLFLEX® connection and control cables and UNITRONIC® data cables. The innovative centrepiece of the service and logistics centre is Hall 2, which is capable of storing up to 74,000 cable drums with diameters ranging from 400 to 800 millimetres. Fork-lift trucks carry these to a conveyor belt around 700 metres long and 600 millimetres wide, with four transfer stations ready and waiting. From this point, the entire process is automated thanks to two innovations patented by Lapp. The first comes in the form of special gripper arms, known as “Dorngreifer”, which insert a spine into the middle hole of the drum. This then opens up, enabling the drum to be lifted. In just one hour, one of these gripper arms can transport at least 60 drums weighing up to 400 kilos each. The second patent is a specially developed system pallet made of plastic. It features nubs and grooves, keeping the drums secure and stable for further transport. The allocation of items within the warehouse is also fully automated, using light barriers and RFID technology. Along the 18 shelf aisles, storage and retrieval units pack the drums into their designated locations or retrieve them – a further space-saving measure. Previously, aisles had to be up to four metres wide to accommodate the fork-lift trucks; now, 1.20 metres is fine. The standard pallet warehouse is in Hall 3, and is capable of storing around 17,000 cable drums with diameters of 900 millimetres and over. 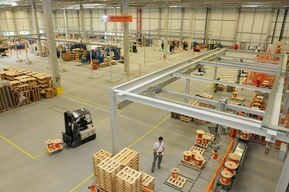 The automated coil warehouse in Hall 1 offers a further 11,000 storage locations. In Hall 1, orders are cut to length, packaged and labelled, all in accordance with the customer’s requirements. Twelve unmanned transport systems carry the cable drums to the cutting station. The personnel here can handle up to 150 drums per day. Finally, coils or drums are sent by conveyor belt to one of the five packaging stations. Together, these are capable of readying 334 drums and 165 coils for dispatch hourly. Customers can now receive one single shipment containing every product in their order, as opposed to multiple packages from different locations. The result: shorter delivery times. The new service and logistics centre also offers considerable advantages to employees, who are now able to work in an entirely dust-free environment. And all workstations are ergonomically designed to reduce the stress placed on the operator’s back. This emphasis on a single location given over to cable drums has eliminated the need for countless internal transport journeys. Annual savings are estimated at 750 HGV journeys each year, which in turn means an annual CO2 saving of around 155 tons.